Sierra Nevada Corporation’s (SNC) Space Systems is pleased to announce Lockheed Martin Space Systems Company, of Littleton, Colo., is joining the SNC Dream Chaser® team. Lockheed Martin will be an exclusive partner to SNC on NASA's Certification Products Contract (CPC), and has been competitively selected to build the composite structure for the Dream Chaser at NASA’s Michoud Assembly Facility in New Orleans, La. 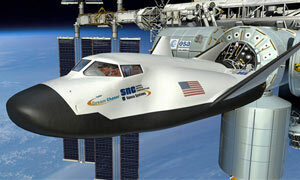 "The SNC team is thrilled that Lockheed Martin will be joining our expanding world-class team of partner organizations also working to certify the Dream Chaser Space System for crewed flights to the International Space Station for NASA,” said Mark Sirangelo, corporate vice president and head of SNC’s Space Systems. Lockheed Martin is developing NASA's Orion Multi-Purpose Crew Vehicle (MPCV), and brings extensive and current experience in obtaining NASA certification for a crewed flight vehicle to the Dream Chaser program. The composite structure for the Dream Chaser flight test vehicle is being built under the SNC $212.5 million Space Act Agreement for the NASA Commercial Crew Integrated Capability Program. This effort leverages the extensive Lockheed Martin experience in building composite structures for spacecraft and high performance aircraft. The SNC and Lockheed Martin partnership represents the best of entrepreneurial spirit and established space mission success, collaborating on vehicle development, certification and reaching additional customer markets for the Dream Chaser orbital vehicle. Sierra Nevada Corporation’s Space Systems business area has more than 25 years of space heritage in space, and has participated in over 400 successful space missions through the delivery of over 4,000 systems, subsystems and components. During its history, SNC Space Systems has concluded over 70 programs for NASA and hundreds of programs for more than 50 other clients globally. For more information about SS visit www.sncspace.com. Sierra Nevada Corporation (SNC) is one of America’s fastest growing private companies. Under the leadership of CEO Fatih Ozmen and President Eren Ozmen, SNC employs over 2,500 people in 32 locations in 17 states. SNC’s six unique business areas are dedicated to providing leading-edge technology solutions to SNC’s customers. For more information visit www.sncorp.com.